Within the borders of my homeland whose economy is barely functioning, we live a Balkan variant of a facade democracy which does not allow for the existence of independent and functional institutions. Kotor, Montenegro. Wikimedia commons. Some rights reserved.Montenegro is the only country which is currently negotiating the terms of its EU membership with the administrations in Buseles. During the last two years 16 out of 35 chapters have been open. Because of significant problems Montenegro has with corruption and organized crime as well as with an inefficient judiciary, which is also the subject of a considerable political influence by the ruleing elite, the EU had opted for a new approach: the negotiations opened with chapters 23 and 24 (judiciary and the rule of law) and will conclude with those same chapters. Moreover the bilateral agrement Montenegro signed gives the EU administration the power to invoke the 'overall balance clause' and effectively freeze the ascension process if progress made in the negotiation of chapters 23 and 24 has been deemed unsatisfactory. It is worth noting the lack of measurable outcomes in the past two years of negotiations. Despite the demonstrable lack of progress on the road to EU membership, as noted in the EC Yearly Progress Reports for 2013 and 2014, the prime minister of Montenegro likes to point out that his country is a ‘regional leader’ in EU and NATO integrations. Aside from constituting a misrepresentation of facts, such boasting by the Montenegrin top government official indicates the significant problems facing other regional candidates for the EU membership: Serbia, Bosnia and Herzegovina, Kosovo, and FYR of Macedonia. As someone who playes an active role in the political life in Montenegro, I could say that my country indeed exists and functions on that proverbial political, geographic and security border country between East and West. Within the borders of my homeland whose economy is barely functioning, we live a Balkan variant of a facade democracy which does not allow for the existence of independent and functional institutions. According to local as well as European observers and analysts, Montenegro's rulling elite as well as our judiciary and law enforcement agencies are utterly corrupt. Analysts also warn about the strong ties between law enforcement and organized crime. Last year’s scandalous leaks of classified audio material, known as the Snimak affair, clearly documented the government and ruling party officials in concerted efforts to commit electoral fraud, intimidate and bribe voters, and rig election results. This scandal demonstrated that the election process in Montenegro has been controlled by the ruling party and thus rendered meaningless. It is because of irregularities and election fraud, among other reasons, that Montenegro is yet to witness a peaceful and democratic transition of power. This could have been just another sad tale of ‘transitional pains and challenges’ had it not been for a worrying security element. Namely, the emerging and gradual strengthening of the ‘politically influential’ Montenegrin mafia (observation in the EC Yearly Progress Report) with ties to Russian criminal networks and specifically with the so-called ‘Russian cocaine’ cartel (as noted by the American DEA and Italy’s DIA investigations into Šarić, Dudić-Fric, and Keljmendi cases). 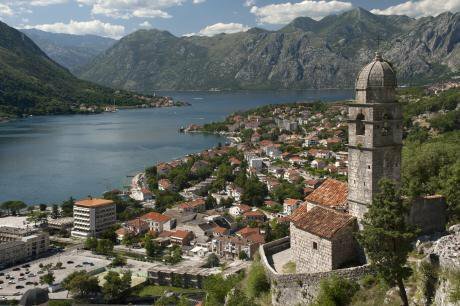 In terms of geo-politics, Montenegro’s position is not an enviable one. It shares border with the EU (Croatia) and also with authoritarian Balkan states (Serbia, Kosovo, FYR of Macedonia). While some of our neighbours side with the West and impose economic sanctions against Russia, others stage a massive military parade to mark the state visit by Vladimir Putin. Furthermore, according to the findings by Western intelligence agencies, many criminal organizations from Montenegro have developed extensive networks of regional contacts, and are often contracted out by neighboring autocratic regimes. This is a textbook example of so-called “hybrid” security threats in the Western Balkans. This created a regional criminal network whose financial capabilities have long surpassed those of individual states. Such networks often act as both a creditor and a strategic partner of individual states. What we have in Montenegro is mafia acquiring the right to full citizenship and exercising significant influence in policy development. In addition to controlling substantial financial assets such criminal network has its own media outlets as well as a firm foothold in state intelligence services whose main task is to slender, keep under surveilance, and intimidate opposition leaders while praising and promoting the ruling elite. When it comes to economy, the situation is equaly troubling. Over the past two decades the government of Montenegro had sold almost the entire proverbial family silverware. Virtually the entire industy had been privatised in a rather questionable manner. In addition to selling off and privatizing everyhting the government had borrowed in excess of 45% of the country's GDP, while the unemployment rate continued to grow steadily. Montenegro's foreign debt is currently sitting on over 60% of the GDP, and the amount of uncollected taxes paired with the internal debt exceeds 30% of the annual revenues. If we add to this the most recent capital project agreed on with Chinese partners– the building of a highway in Montenegro – and the ongoing legal proceedings related to request for compensation by a former strategic partner and the former owner of the largest aluminum plant in Montenegro, Oleg Deripaska, the economic future looks even beleaker. Every international financial institution that was asked to comment on the Montenegro's plan to build the highway with Chinese partners had warned against proceeding with it. As for Deripaska's request, Montenegro is in real danger of losing the arbitration process and having to pay the Russian oligarch a compensation of upwards of 20% of the country's GDP. Even though it may sound strange to say it, I believe that the aforementioned problems are not the greatest obstacle to implementing reforms in Montenegro. I would argue that rapidly deteriorating geo-political situation in the region as well as in the Mediratteanina basin and Eastern Europe constitutes the gravest threat. Following the balkanisation of Ukraine, which was done following the earlier Bosnian scenario, the West once again views the Balkans through a crisis management lense. The most recent statements made by the U.S. officlas were a cause for concern. The U.S. Secretary of State, John Kerry, went so far to suggest that both Montenegro and Serbia are 'in the line of fire' in the ongoing confrontation with Russia. Experience teaches us that such statements by high-ranking Western officials mean a shift in their priorities from issues of democractization and reforms to those of security. That is why I believe the current geo-political dynamics in the region is the greatest obstacle to reforming Montenegrin society. The reform-oriented rhetoric notwithstanding, the Montenegrin governing elite has never been truly interested in EU integrations; it rather viewed the process as an inconvenient but necessary political manoeuver. The structural reforms it espouses – strengthening the rule of law, establishing state institutions independent of partisan influence, fighting against corruption and organized crime – have been identified by the Montenegrin regime as threat to its own safety and remaining in power. That is why the Montenegrin government appointed its former chief of secret police to oversee the process of EU integration. The political opposition is concerned that the absence of measurable results in investigating and prosecuting cases of high-level corruption and alleged mafia bosses as well as election fraud and mishandling of public funds could seriously jeopardize, if not altogether halt, Montenegro’s EU accession. The issue of NATO membership, on the other hand, has been treated very differently by the Montenegrin government and the ruling coalition. For them the benefit of NATO membership is threefold: it secures the benevolent treatment by the U.S. and forces the EU to grudgingly tolerate a reform-averse regime, while it also serves as a powerful weapon in discrediting their political opponents who are calling for reforms by misrepresenting their actions as anti-Western, anti-American, and pro-Russian. That is why the government in Podgorica had decided its troops should join the NATO mission in Afghanistan even though Montenegro is not a member of the North Atlantic military alliance. Over 20% of Montenegro’s rather small standing army served as part of the ISAF mission. This balancing act by the Montenegrin government could be termed ‘with NATO, against reforms’. It went on without a glitch until the issue of formally joining this organization became part of the official agenda. It was then that troubling links between Montenegrin intelligence services, structures of organized crime, and Russian intelligence agencies as well as the influence organized crime has on policy-making came to the fore. Those problems had been noted by both NATO and EU officials over the past two years but the government in Podgorica chose to ignore subtle messages couched in a diplomatic language. I believe that is why Montenegro was not invited to join NATO during its summit in Wales. I also believe the Alliance is aware that for the Montenegrin ruling elite to reform its security agencies and intelligence sector would equal the cutting off of a branch these former communist functionaries have been sitting on for the past 25 years. All being said, not everthing in Montenegro is beyond the pale. There are models of political action which deserve atention and support. Moreover, the situation seems to favour reform-oriented political forces. The EU is clearly nervous over the lack of reforms and the sluggishness of the government in Podgorica in implementing them. The U.S. seems unsure about where the loyalties of Montenegro's security and intelligence aparatus lie. Furthermore, over the last year or so, a powerful coalition of opposition parties ready to implement the necessary reforms along the lines indicated by both Brussels and Washington has emerged in Montenegro. While this new opposition coalition was forming, the crisis in Ukraine erupted. It came as a political 'manna from heaven' to the Montenegrin rulling elite because it altered the geo-political dynamics and shifted the focus of the West from the issue of domestic reforms to those of regional security and stability. Moreover, because of its long-standing friedly relations with Russia, the government in Podgorica was able to once again bargain with the West and effectively secure its further non-compliance with requests for reforms. Djukanović's government has also revived the old false dillema - NATO or Reforms – and managed to again polarize the domestic political scene. Many had argued that the aim was to incentivise the international community to turn the blind eye to yet another electoral fraud in Montenegro. Furthermore, it offered to the citizens a choice that, in fact, is anything but: choose between those who are siding with Vladimir Putin, and the current model of governing which could be approriately termed Montenegrin putinism. I could not emphasize the falsity of this dilemma strongly enough. I am convinced that the goal of becoming a member of NATO while reforming Montenegro is indeed achievable. It is, thereforee, of paramount importance that our international partners refocus their attention back on to the issue of reforms in Montenegro. To say that, with balanced approach and the implementing of much needed reforms, a small Montenegrin economy could recover quickly would be stating the obvious. Within a few years of it being sworn in and in cooperation with our colleagues from Brussels, a new reform-oriented government could sucessfully address the problems of corruption within the judiciary, strengthen institutions, and meet the European standards in the sphere of the rule of law. It is true that the fight against organized crime would be long and difficult, but it is also true that one needs to start such a fight in order to win it. There is a political force in Montenegro that is able and ready to work towards meeting the abovementioned goals. That is a powerful opposition coalition whose support is constantly on the rise and is currently commanding 30% of the electorate. It is a political coalition whose program is anchored in western democratic values and whose devotion to reforms is beyond reproach. Regardless of the current and worrisome geo-political dynamic, it would be wise of our Western partners to pay closer attention to this reformist political coalition. By doing that, they would clealry recognize corrupt, criminalized, and anti-reform power structure as the significant creator of problems that contribute to further destabilizing the entire region. To read more about the challenges facing specific EU candidate countries, click here.